Picture - Map of the border changes in the Julian March: with the Treaty of Rapallo, Italy received most of the Austrian Littoral, part of Inner Carniola, and some border areas of Carinthia. The Treaty of Rapallo was a treaty between the Kingdom of Italy and the Kingdom of Serbs, Croats and Slovenes (renamed Yugoslavia in 1929), signed to solve the dispute over some territories in the upper Adriatic, in Dalmatia and in the region known as the Julian March. The treaty was signed on 12 November 1920 in Rapallo near Genoa in Italy. Tension between Italy and Yugoslavia arose at the end of World War I, when the Austro-Hungarian Empire dissolved and Italy occupied the territories assigned to it by the London Pact of 1915. These territories had however an ethnically mixed population, with Slovenes and Croats composing over the half of the population of the region. 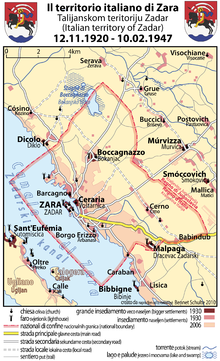 According to the treaty, the city of Rijeka (known as Fiume in Italian) would become the independent Free State of Fiume, thus ending the military occupation of Gabriele d'Annunzio's troops, known as the Italian Regency of Carnaro. This part of the treaty was revoked in 1924, when Italy and Yugoslavia signed the Treaty of Rome, which gave Fiume to Italy and the adjacent port of Su�ak to Yugoslavia. The treaty left a large number of Slovenes and Croats in Italy. According to author Paul N. Hehn, "the treaty left half a million Slavs inside Italy while only a few hundred Italians in the fledgling Yugoslav state". According to the Austrian census, around 25,000 ethnic Germans and 3,000 Hungarians also lived in the regions annexed to Italy with the Treaty.